Grading your property is the process of making it level and ensuring good drainage is in place in preparation for installing landscaping such as a new lawn, a new patio, a driveway, or garden beds. Are you building a new home and looking to have your property cleared and graded in preparation for construction or your landscaping? Does your property need to be regraded with more of a slope away from your home? Property grading problems are quite common and can cause water to pool or even flood areas of your property, erosion slowly changes the topography of your land. Why Do You Need Property Grading? Do you have drainage problems you need repaired? Are you wanting to install a new lawn? Do you want a level area for a new patio? Are you looking to build a new shed or shop? Do you need a gravel parking pad constructed? Green Acres Lawn & Landscape is a licensed and insured Kansas City landscaping company that specializes in lot leveling and property grading services. We specialize in property grading services. 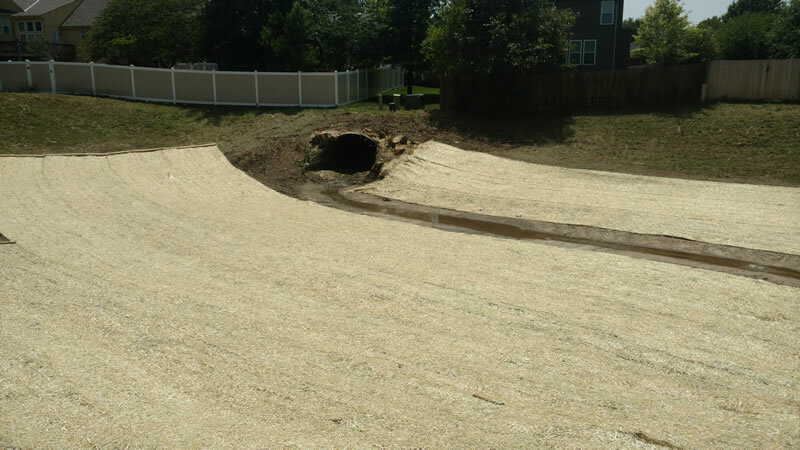 Whether you’re looking to repair some drainage issues, prepare your property for a new lawn or garden bed, or you’d like to prepare an area for a new driveway or an outdoor patio, we can ensure your property is graded level and with a proper slope for drainage and to prevent future erosion. When Should You Call The Professionals To Grade Your Property? Property grading isn’t rocket science, but it can be a lot of labor either by hand or machine depending on how accessible your property is. The most important thing to know is that you don’t want any slope towards your home, foundation, or any other structure, shed, fence, retaining wall, etc. If your property is suffering from a few small low spots or small areas of pooling water it’s a project that might be worth the DIY route. Simply fill the low spots with new fill, top with some soil, let it settle for a few days/rains, fill as necessary and then seed or sod the area. If your poorly graded property is threatening your home or structure or if you’re trying to regrade an entire lot or multiple lots for new lawn installations or other landscaping purposes then give us a call (913) 422-5111 and we’d be happy to provide you with an estimate! If you’d like to get an estimate or schedule a consultation to discuss your property grading requirements then give us a call (913) 422-5111 or fill out our online contact form and we’ll get back to you right away.